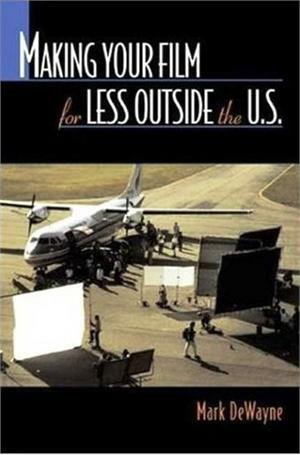 Home > Writing > Biz > Making Your Film For Less Outside the U.S.
At last, Making Your Film For Less Outside the U.S. is a definitive step-by-step guide that explains everything needed to successfully produce and distribute films overseas. In-depth interviews with nine entertainment industry veterans who have worked in Canada, Mexico, England, France, Bulgaria, South Africa, the Philippines, Hong Kong, Australia, and Thailand reveal how costs can be dramatically decreased by producing internationally without sacrificing the quality of the film. Featuring easy-to-follow sample budgets that offer cost-cutting tips on everything from transportation, location fees, wardrobe, hair and makeup, catering, and equipment, this definitive resource teaches beginning and professional filmmakers alike how to benefit from working outside the United States. Mark DeWayne is an international production consultant who specializes in helping producers and writers advance their projects. He is the founder of Reserved Productions, a Thailand-based consulting and scouting company, and has founded and promoted countless networking events in the United States. Mark has written, produced, and directed three documentaries, and has served as stunt coordinator for commercials, features, and live performances. He lives in Thailand.